Long before Sushi Saito first received three Michelin stars in the Tokyo guide back in 2009, it was already quite arduous to get a seat at the spartan sushi bar in the city’s Ark Hills complex. 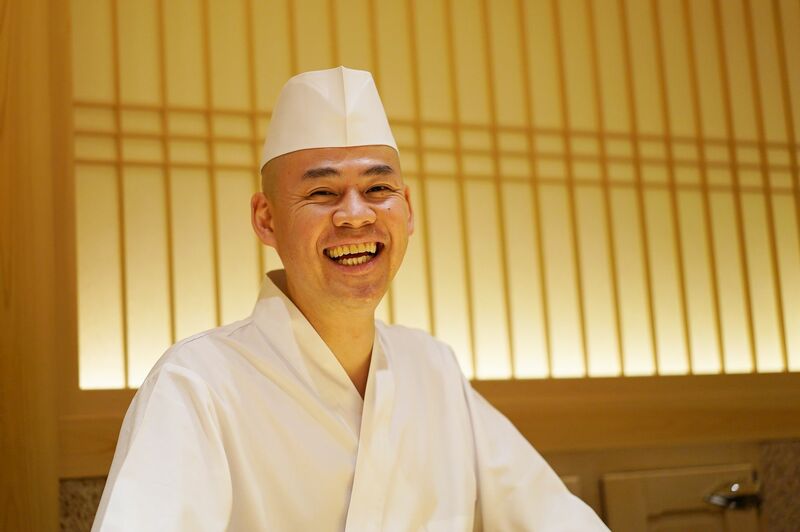 Ask anyone who has been, and they will understand—chef Takashi Saito is perhaps best known for his kodawari, that unflinching dedication to a purist Edomae ideal of sushi. Those who have had the good karma to taste his craft, including Joël Robuchon, often claim that Saito makes the best sushi on the planet. And it’s not just famous Frenchmen who sing praises of Sushi Saito—it’s frequently ranked as the top sushi bar on Tabelog, Japan’s go-to restaurant review site. This March, Saito will unveil a branch of his eponymous restaurant in Four Seasons Hong Kong, and it is already slated to be one of the year’s most highly anticipated openings. On the sushi chef’s only free day in Hong Kong recently, we had quick chat. Was making sushi what you wanted to do when you were young? Did you have any other dream jobs growing up? No, I wanted to be a baseball player for the Yomiuri Giants. That dream is long gone and dead now. You are known to go to Tsukiji market daily to source ingredients. What forms your morning routine? How do you like to start your day? I wake up at 6:00am, and go to Tsukiji at around 6:30 with Kobayashi [his second-in-command for eight years who will be manning the sushi bar in Hong Kong]. I don’t really have time to do breakfast. I usually just have a coffee, and maybe a rice ball. I have lunch at my restaurant. How has your palate, and thus your approach to sushi, changed over each decade of your life? What flavours do you find yourself gravitating more towards today, compared to when you were growing up? I’ve always loved fish and, obviously, I still do. I don’t think my palate has changed. But the oceans have, and the quality of the seafood is different from before when it comes to their size, texture, and oil content. There are also a lot more varieties of vinegar available nowadays. So what I do is to adapt to today's ingredients [by changing] how I age the fish; cook the rice; the amount of vinegar I use. I would like to keep the taste of my sushi as traditional as possible. What is traditional sushi to you then? Sushi is just rice, vinegar, seafood, soy sauce and wasabi. It’s just that. It’s very simple. It’s a very narrowly circumscribed world. Compared to say, French or Italian cuisine, there aren’t really noticeable visible changes in the appearance of sushi. For me, putting Ossetra caviar on sushi is not sushi anymore. Fusion sushi isn't “sushi” [JP: Saito uses the honorific o- before the word sushi, denoting reverence]. It feels like a different cuisine to me. Of course, it’s up to the consumer to decide whether they want that or not, but what I go for is traditional sushi. For me, the shari (the body of the sushi, i.e. the rice) is the most important part of sushi. I pay a lot of attention to the shari. What is your belief when it comes to the future of the sushi chef profession? What challenges do you predict? I’ve been asked that a lot. I suppose [serving sushi] overseas is the challenge for most Japanese sushi chefs now. My personal challenge is to serve sushi in Hong Kong whilst maintaining the same quality of my Tokyo restaurant. Outside of Japan, Hong Kong really is the only place that can get ingredients from Tsukiji on the same day. So I feel quite good opening here. Your restaurant has legions of fans but is very limited in seating and notoriously difficult to book. How do you feel about the fact that only a very small percentage of the world will be able to savour your sushi? Well, I’m quite happy and content for now, to be honest. But of course, I would love it if I could let more new customers try my sushi. We’re an eight-seater but we are already working our butts off. There are actually almost ten staff in the back kitchen. I don’t want the quality to go down. I guess Hong Kong gets to try now. What do you do to unwind after a long day’s work then? Drink. And sing. I love karaoke—Southern All Stars and Mister Children. Or I go hang out at my friends’ places, such as Yakiniku Jumbo, Tempura Takiya, or À Nu. I don’t have any friends who do sushi. I don’t know. I don’t really go for sushi in Tokyo. Have you tried any sushi places in Hong Kong? Sushi Saito will open on March 25, 2018, at the Four Seasons Hong Kong. Stay tuned as we bring you details on how to make your reservations.